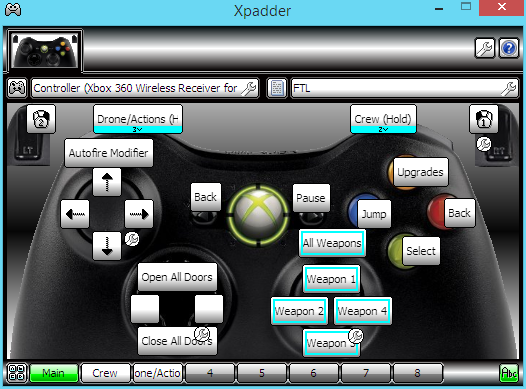 Here's a profile for FTL that covers more of the controls than the other profile available. It adds some macros for things like weapons selection/targeting and teleporting. This began as a reworking of Deltex's original profile to put certain controls where they more often reside. (e.g. Pause as the Start button instead of Left Trigger.) I had trouble adjusting to certain button placements as they're far too deeply ingrained. Turned out to be quite handy as it removes a lot of extraneous user input. It combines the actions of "selecting the thing to use" and "selecting the target to use it on" for weapons, crew etc. Set 1- The weapons are set to fire at target selection. Pro-Focusing fire on a single target is as easy as putting the cursor over it and rotating the Right Stick. Con-Using the Right Stick for things like dialog box options can result in extra clicks if the cursor is on top of it. Just make sure the cursor isn't on top of dialog boxes or the Store window when using the Right Stick to enter numbers. Set 2- Teleporting works like the weapons, teleportation activates at target selection. 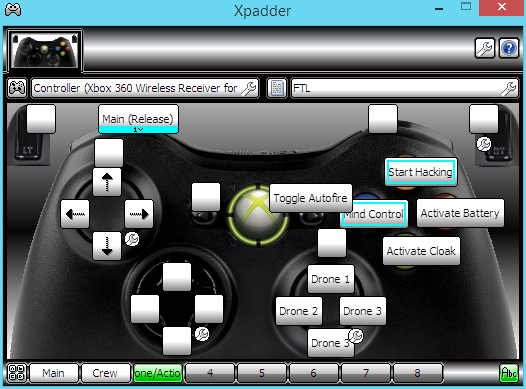 The D-pad controls "Away Teams". It selects two crew-members and sends them to the cursor. Pro-You can send two people to any location with one button-press. Con-Crew order can change somewhat often. So the profile needs to be updated appropriately. Random Semi-Useful Hint: Rename your crew to have their number in front of their names. Set 3- Hacking and Mind Control also fire at target selection. I've found the "do the thing upon targeting" aspect very useful. To the extent I'd have trouble going back to the original k/m method. 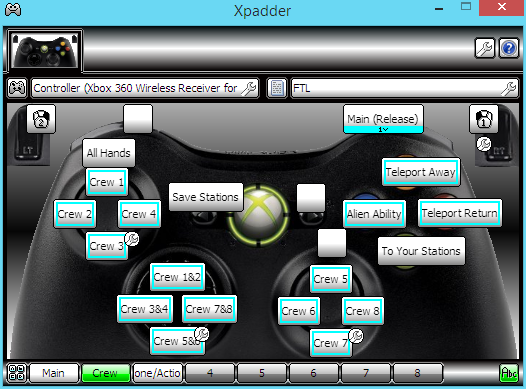 Edit: Changed individual crew to the same "activate on targeting" and added a fire "All Weapons" to the Right Stick button. Let me know if there are any questions, etc. For some reason I only sporadically get any notifications from boards, so feel free to track me down via my username if you don’t get a timely response from me.